This year Christmas was a travel day. 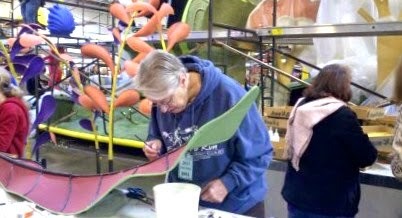 We left our volunteer spot as campground hosts at Joshua Tree National Park and moved about ninety miles to our next adventure in Irwindale, CA where we spent a week decorating a Rose Parade float. This activity has been on Michelle's bucket list for many years and we both looked forward to it. I knew nothing about how to get involved or who to contact, so the research and planning began on the worldwide web last spring. By the time our adventure began, I had accumulated a ton of information. I'll be happy to share it with anyone who is interested. Just leave a comment on this article. Rose Parade floats are built by three companies and several private organizations. 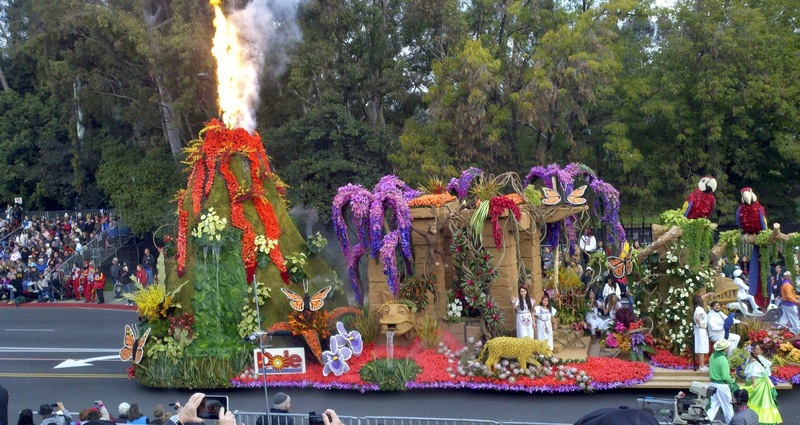 We chose to participate with the company Fiesta Parade Floats. This was not a WorKamping experience. The company allows volunteers who arrive in RVs or Towables to boondock in their parking lot -- no hookups. Also no free or discounted parade grandstand seating tickets -- forget that. Rose Parade ticketing is done by a different company. Fiesta Parade Floats built ten floats for the 2013 Rose Parade -- all in one building. 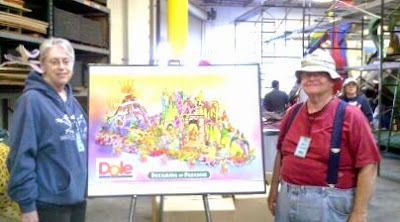 We were assigned to work on the Dole Float. As with most of our adventures, we met a lot of people from all walks of life and all parts of the country. Only three were there in RVs. Some volunteers came from the local area and participate every year and most of the out-of-towners stayed in hotels. Surprisingly, many were fulfilling an item on their bucket list too. As the week passed we got to be friends with several of the volunteers and we all got invested in the float as if it was our own. Watching it take shape from day to day became exciting, especially on the last couple days when the floral arrangements and roses were put on. 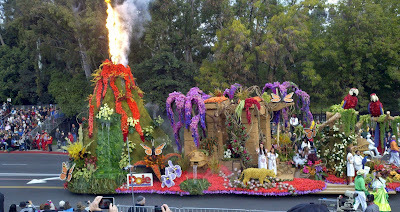 Our float (the Dole float) contained over 8,000 roses each in a vial of water and individually mounted. It also included four waterfalls and a volcano with real fire. The red roses on the volcano representing hot lava flowing down the sides. 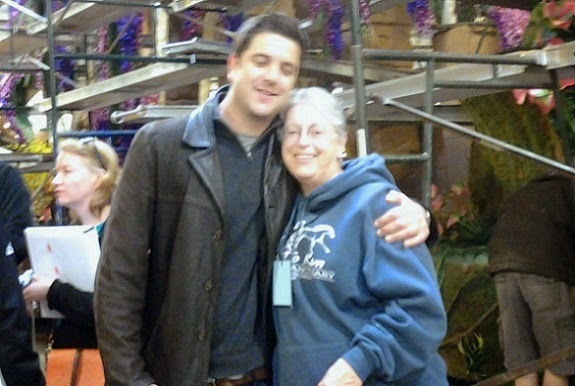 For Michelle, the thrill of the week was a visit by Josh Elliott the television journalist who is the news anchor for ABC's Good Morning America. He posed for a picture with Michelle who is a great fan of his. Our work looked great in the parade.